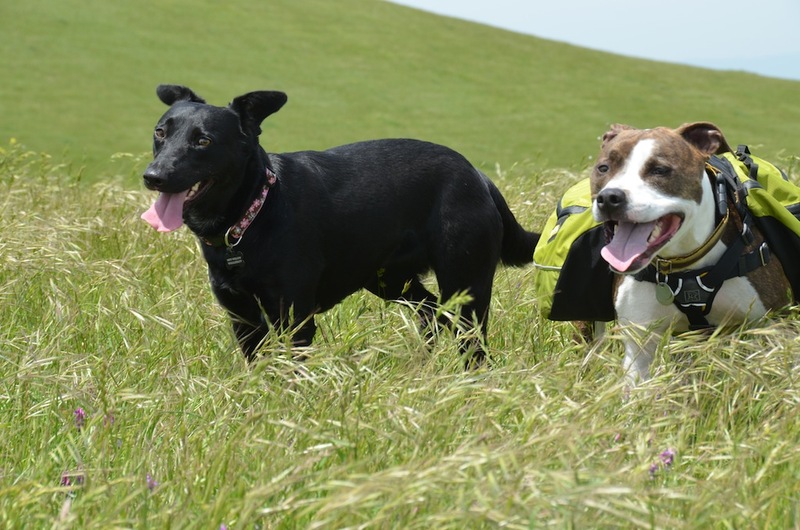 We were surprised and delighted to hear that Brian, one of Willow’s rescuers was going to be down in the San Francisco Bay Area on business at the same time Willow and I were passing through. We coordinated our schedules around his business plans and found an open window we could meet up in. Seeing Brian would have been treat enough for Willow but when we heard that he was also bringing two members of his pack (and two of Willow’s best doggie buddies) down with him well…that was icing on the cake. 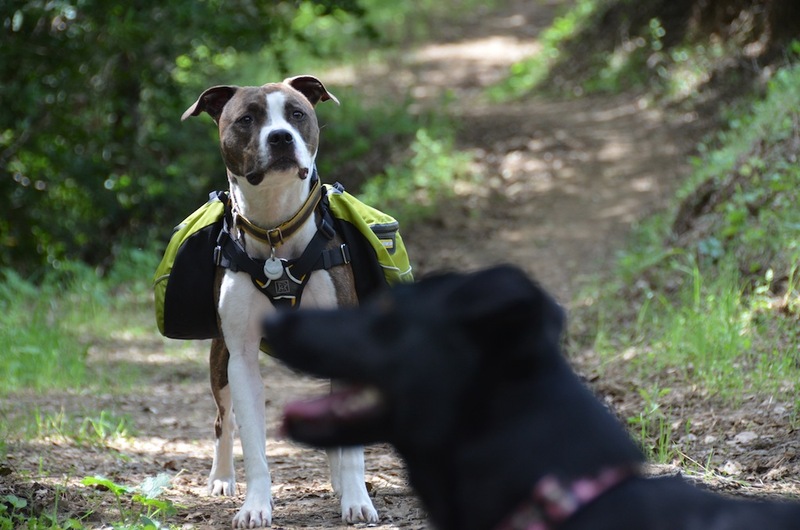 He had heard about a hiking area in Martinez and we decided to give it a try. Just off Hwy 4 near Alhambra Avenue is the Carquinez Strait Regional Shoreline. 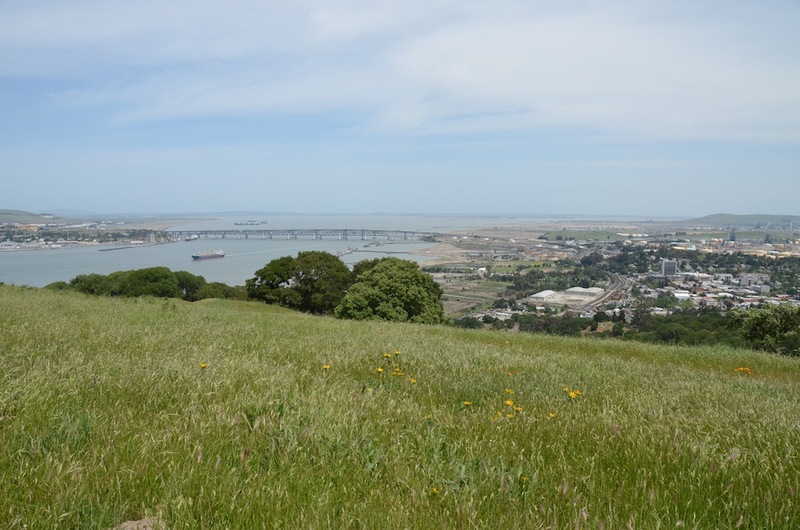 It’s an area crisscrossed with hiking, biking and equestrian trails many which look out over expansive vistas of the surrounding waterfront area near Port Costa, Martinez and Benicia. 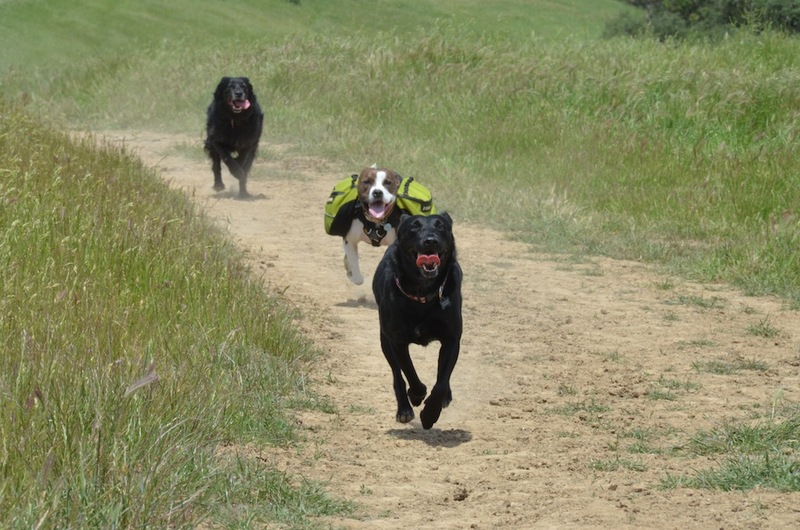 We met at the trailhead off Carquinez Scenic Drive and a joyous, bouncy reunion with her doggie friends Charlie the Pit Bull and Dorian the black fluffer nutter and elder stateswoman of their pack ensued. Once the craziness died down we got Chuck’s Approach Pack on, water bottles filled and stowed and leashes attached so we could start the hike. Once out of the parking area the leashes were unsnapped and the dog trio took the lead. We headed out onto the Hulet Hornbeck Trail which winds up a mildly steep single track path under the shade of various types of trees. The going was slow but steady and we stopped a couple of times to lighten Chuck’s load by parceling out water from the bottles he carried in each side of his pack. He is such an amazing physical specimen that he didn’t seem to notice one way or the other. Once we emerged at the top of the breeze-swept, grassy-topped hill the sudden arrival of such fearsome predators sent the local jack rabbits and ground squirrels all aflutter and a great game of chase ensued. 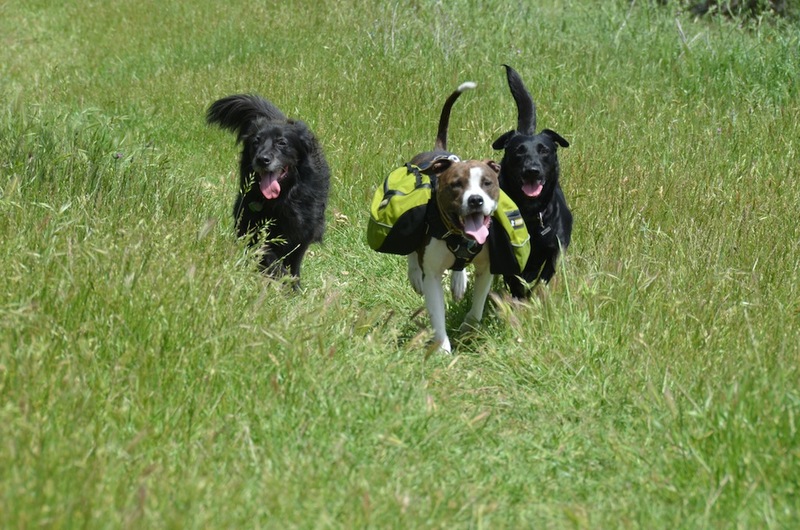 The trio of fuzzy butts took several detours to go bounding through the shoulder-high grasses in hot pursuit of their “prey.” FYI – None of the local fauna was caught, hurt or killed during this outing. For such an unsuccessful “hunt” great hilarity was had by all…except, maybe, the critters being chased. We stopped at a weathered bench at the top of the hill for a drink and a break. Brian took that time to use his actual DSLR camera to capture the fun and the views so you get to see some of those pictures on this page. 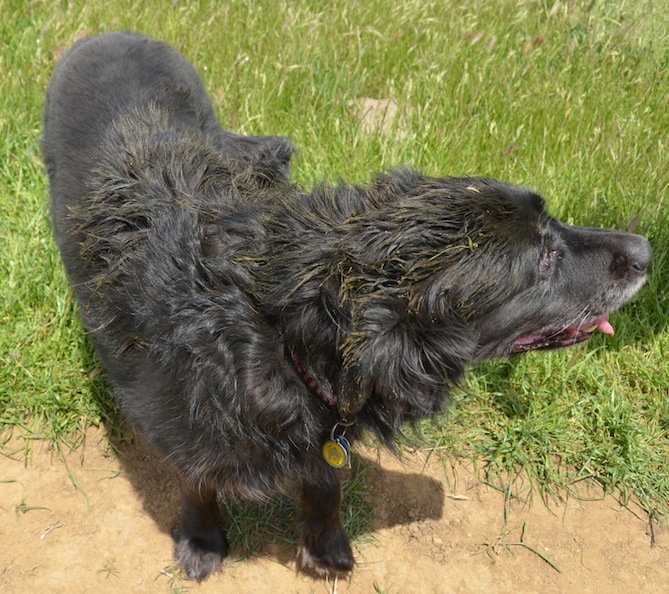 This is also the very specific hike where Willow picked up her lovely habit of rolling in fresh cow poop courtesy of Dorian. 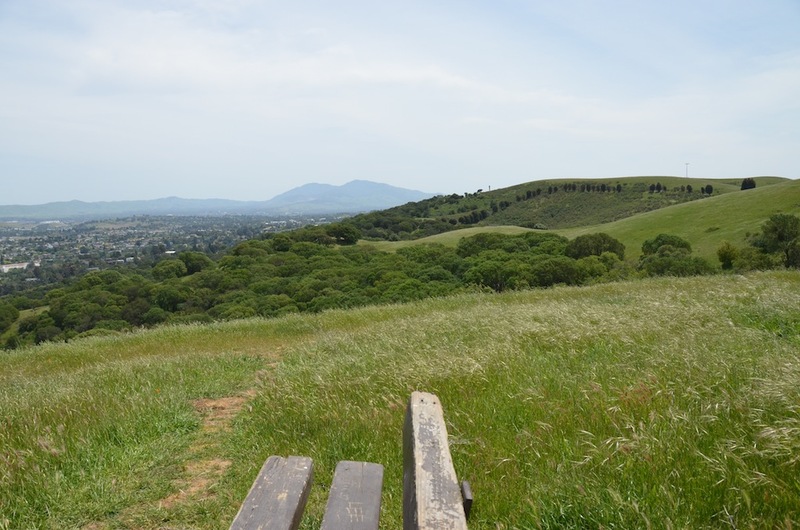 So, why is this post called “The Infamous Martinez Double-Hike?” Remember that bench we stopped at up on top of the hill? Well, after all our fun we hiked all the way back down to the parking lot and started packing up. That’s when we discovered that your humble narrator had left a nice Kleen Kanteen up under that bench. D’Oh! So we quickly decided to double-time it back up to the bench, retrieve said Kleen Kanteen and that’s how the day got its name.